Another means to evaluate the validity of L3MBTL1 gene as a tumor suppressor gene is to compare this gene to TP53 and KRAS. An inference regarding L3MBTL1 as a tumor suppressor may be made based on this comparison because tumor suppressor genes and oncogenes display distinct patterns of mutations. It is critical for Sonya and me to establish if L3MBTL1 is a tumor suppressor gene because this is one of the main assumptions of the study (Figure 2). TP53 is a known tumor suppressor and KRAS is a known proto-oncogene (Figure 1, 3). This comparison should illuminate whether L3MBTL1 is a tumor suppressor gene based upon what mutated gene type it resembles more. 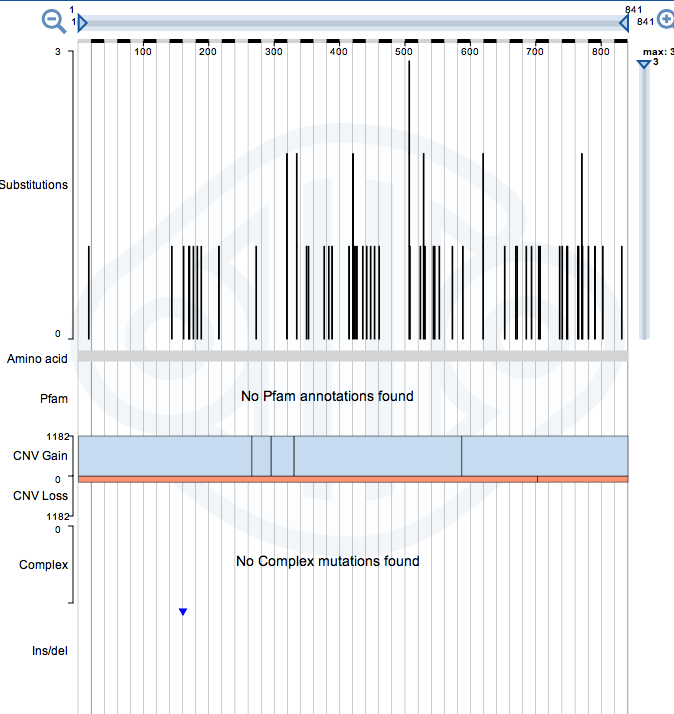 A histogram from Cosmic Database is provided below of the mutations in cancer. The data is based on examination of somatic mutations in cancer and on examination of select papers from PubMed. This histogram illustrates a clear resemblance between L3MBTL1 and TP53. The mutations for L3MBTL1 and TP53 are distributed along the genes coding domain sequence. While, KRAS has a cluster of mutations on position 12 and 13. KRAS has this cluster of mutations because a gain of function mutation is required for a proto-oncogene to be activated. Gain of function mutations are typified by a new molecular function. The concentration of mutations in a specific position indicates this position is central to activating the oncogene. This pattern would suggest that L3MBTL1 is a tumor suppressor gene because more sporadic mutations are required to inactivate the gene. The purpose of these mutations would be to cause a loss of function. A loss of function is required because tumor suppressor genes encode for proteins that may regulate the cell cycle, initiate apoptosis, or may repair DNA. The loss of function will suppress this activity providing the opportunity for neoplasmic mutations. L3MBTL1 function is to regulate chromatin. Chromatin is paramount to regulating gene expression and DNA replication, prevention of DNA damage and is related to mitosis. These functions would fit the model for a tumor suppressor. The loss of function would augment uncontrollable growth and cell proliferation. In all three genes the mutations are dominated by substitution missenses. Substitution missenses may cause a protein to become nonfunctional. A substitution missense occurs when a single nucleotide is altered. The alteration of the nucleotide results in an alternate amino acid being coded for by the codon. In comparison to KRAS and TP53, L3MBTL1 does not have complex mutations meaning it does not contain any mutations with multiple insertions, deletions and substitutions. L3MBTL1 has only one frameshift deletion. Moreover, it has extensive copy number variation gains compared to losses of copy number variations indicating that there is significant increase in major and minor alleles. This appears true for KRAS and TP53. This would suggest that extensive structural changes have occurred, but may have little to do with the etiology of cancer. 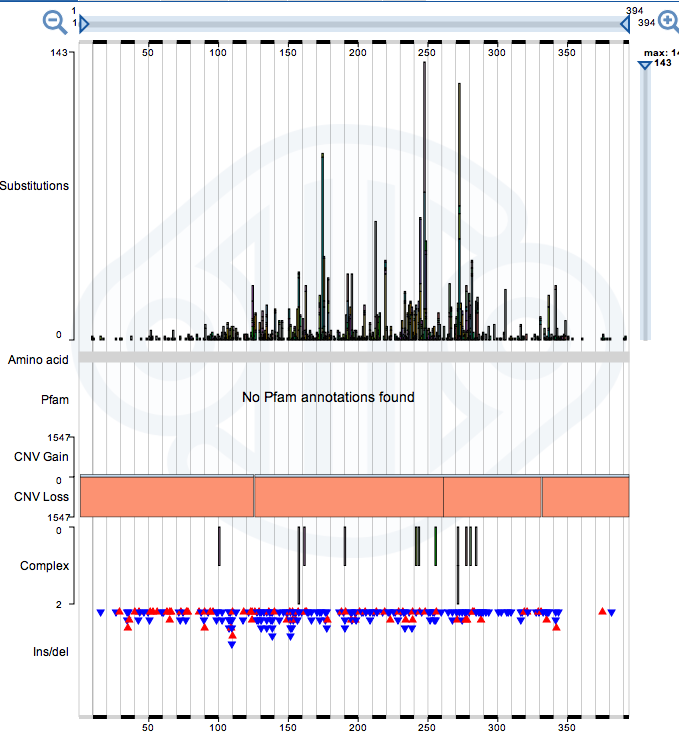 The histogram denotes no Pfam information is available. 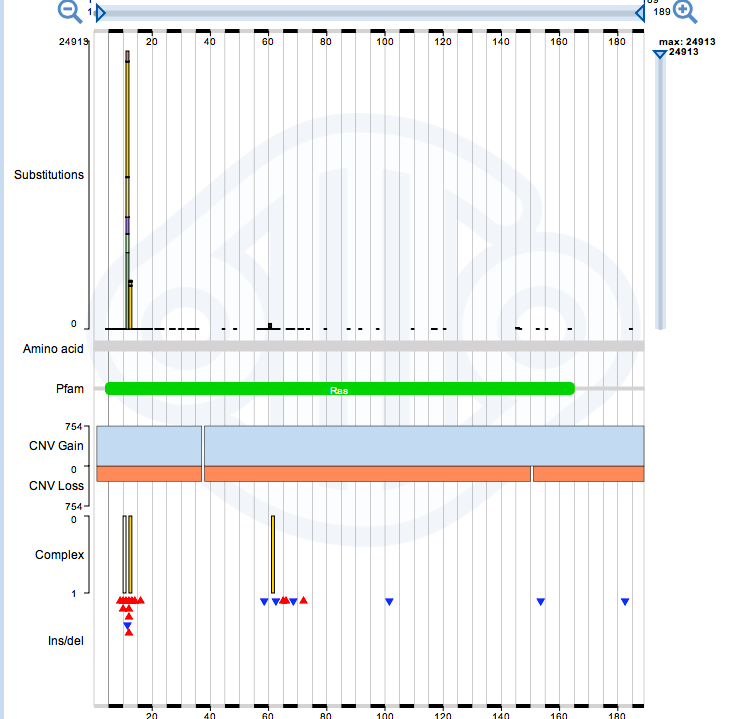 Pfam is a database providing information on protein domains and families. L3MBTL1 is not included in their database. However, this does not depreciate from the argument that L3MBTL1 is a tumor suppressor gene. The Pfam data base serves to represent protein families and this is not essential to the argument that L3MBTL1 is a tumor suppressor. The Cosmic Data base provides conclusive evidence that L3MBTL1 is a tumor suppressor gene as advertised in our study. The clear similarities between TP53 pattern of mutations and L3MBTL1 makes for a substantial case. Additionally, it is very clear L3MBTL1 is not a proto-oncogene based on the comparison to KRAS. This offers greater validity to the claim that L3MBTL1 is related to an increase in survival outcome. Figure 1: KRAS mutations. Insertions are red triangles and deletions are blue triangles. Figure 2:L3MBTL1 mutations. Deletions are blue triangles. Figure 3: TP53 mutations. Insertions are red triangles and deletions are blue triangles.